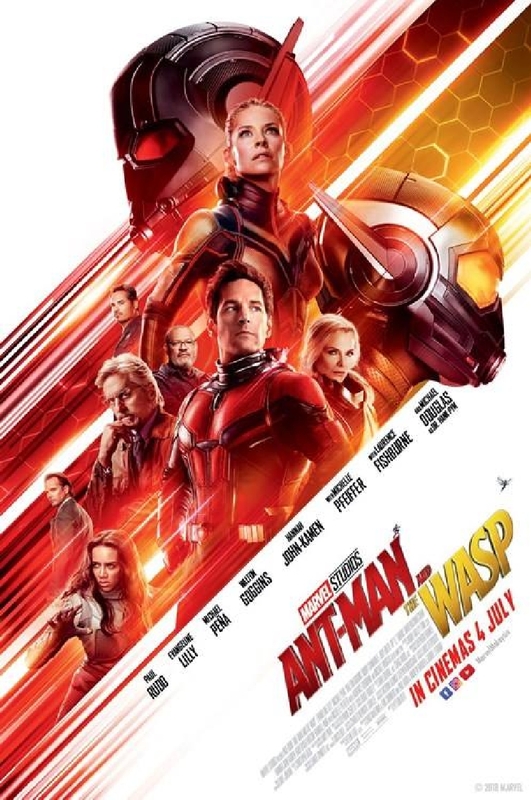 This week Marvel's Ant-Man and The Wasp brings a “smaller” superhero adventure back to cinemas as a sequel to 2015's Ant-Man. It is the 20th movie in the Marvel Cinematic Universe (M.C.U.) as part of Phase Three and takes place close to events of Avengers Infinity War. Because jumping into this latest movie, let's briefly recap on the adventures to Ant-Man to date. 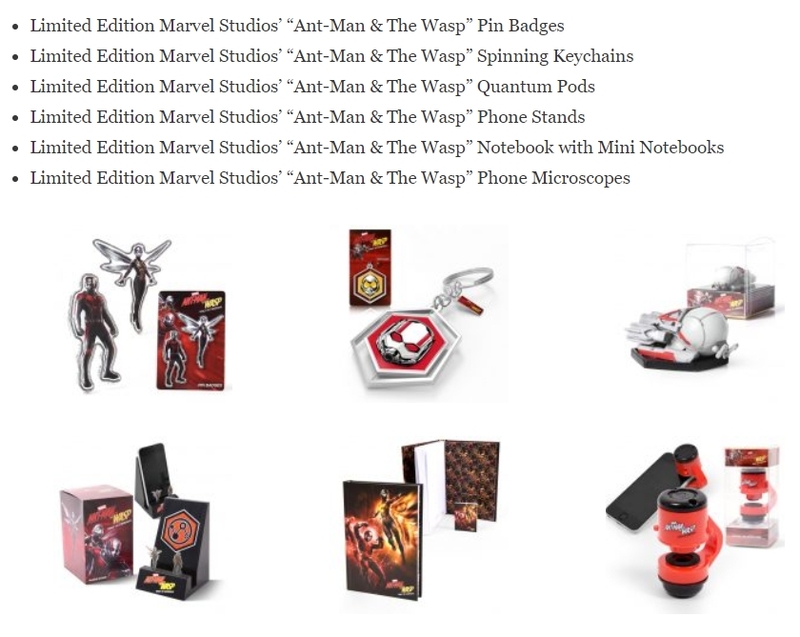 Three years ago we were introduced to the microscopic world of the MCU through the eyes of Scott Lang (Paul Rudd). Being an ex-con, Scott finds it difficult finding regular employment in order to maintain visitation rights with his daughter, Cassie. In order to make ends mean, he soon teams up with fellow ex-con Luis (Michael Pena) to break into a safe in an old house. Scott succeeds breaking open the safe but only finds what appears to be a motorcycle suit. 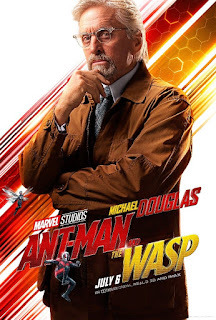 It turns out that the heist was in fact staged by Hank Pym (Michael Douglas) to test Scott as the new Ant-Man. 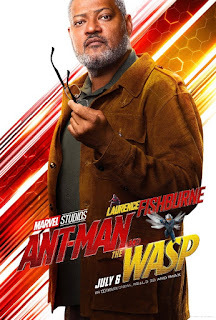 Pym was the original Ant-Man in the 1980s performing clandestine missions for S.H.I.E.L.D. until death of his wife, Janet Van Dyne, leading to a fallout with Howard Stark and the covert organisation. He then setup Pym Technologies but disavowed his shrinking technology for fear that it would be used for nefarious purposes. Unfortunately come present day this former protege Darren Cross (Corey Stoll) is close to replicating shrinking technology with intent to weaponise it. Pym convinces Scott to help destroy Cross' tech research and prototype. Together with his daughter Hope (Evangeline Lilly), they train Scott to effectively use the suit's powers and control ants to aid on the mission. The heist appears to go according to plan until Cross detects the subterfuge and captures Scott, Hope and Pym. Of course, that's only temporary as our heroes escape and destroy the laboratory and research facility. In the process Cross dons his own prototype Yellowjacket shrinking suit and a miniature battle ensues with Ant-Man in Cassie's bedroom of Cassie. To defeat Cross, Scott has to go sub-atomic to wreck the Yellowjacket suit from the inside then disappear into the Quantum Realm. However, Scott manages to overcome debilitating effects of the microverse and enlarges back to the normal world reuniting with his daughter. Watch this Honest Trailers take on the first Ant-Man movie. Fast forward a year, Scott is recruited by Sam Wilson / Falcon during the events of Captain America: Civil War in 2016. 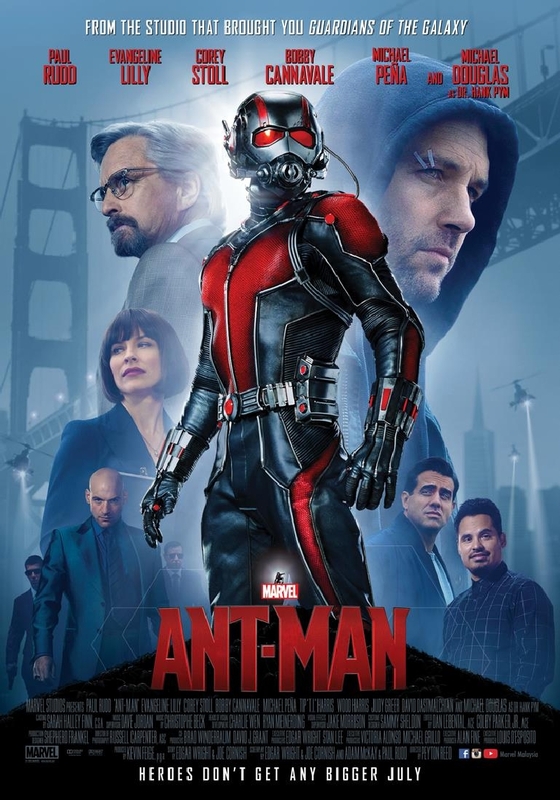 Ant-Man becomes a member of Team Captain America in an epic airport battle against Team Iron Man where Avengers and their associates are pitted against one another over differences on the Sokovia Accords. This incident also showcased that Ant-Man's powers can work in reverse, enlarging him to a massive 65 feet / 20 metre tall Giant Man! Ant-Man joins Team Cap in Civil War. Although Steve Rogers and Bucky escape, the rest of the team are captured and sent to the Raft prison for enhanced humans. Their prison time appears short lived though once Rogers breaks them out and goes underground quitting the Avengers. Here is the Honest Trailers "re-cap" (geddit?). of Civil War. In the Director's seat once again is Peyton Reed with the returning cast of Paul Rudd as Scott Lang / Ant-Man, Evangeline Lilly as Hope Van Dyne / Wasp, Michael Pena as Luis, Abby Ryder Fortson as Cassie, Judy Greer as Maggie (Scott's ex-wife), Bobby Cannavale as Jim Paxton (Maggie's husband), Tip “T.I.” Harris as Kurt, David Dastmalchian as Kurt, and Michael Douglas as Dr. Hank Pym. Plus of course the anticipated cameo by Stan Lee. Micheal Douglas (left) returns as Dr. Hank Pym and introducing Michelle Pfeiffer as Janet Van Dyne. 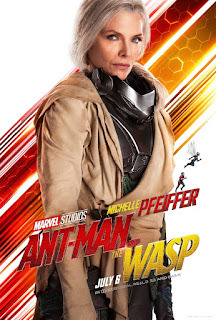 Ant-Man and The Wasp also looks to flesh out Hope's mother, Janet Van Dyne played by award-winning veteran actress Michelle Pfeiffer (Batman Returns, Dangerous Minds). Inspired by Scott's escape from the Quantum Realm, Hank Pym re-examines his technology for a potential rescue mission of Janet who was lost in this microverse three decades earlier. A familiar face in geek pop culture movies, Laurence Fishburne of Matrix infamy portrays Bill Forster, a former colleague of Pym on Project Goliath. Geeks should also recognise Fishburne as the current Perry White from Man of Steel and subsequent movies of the DC Expanded Universe (DCEU). Like Ryan Reynolds, he's certainly another alumni of both Marvel and DC movies. 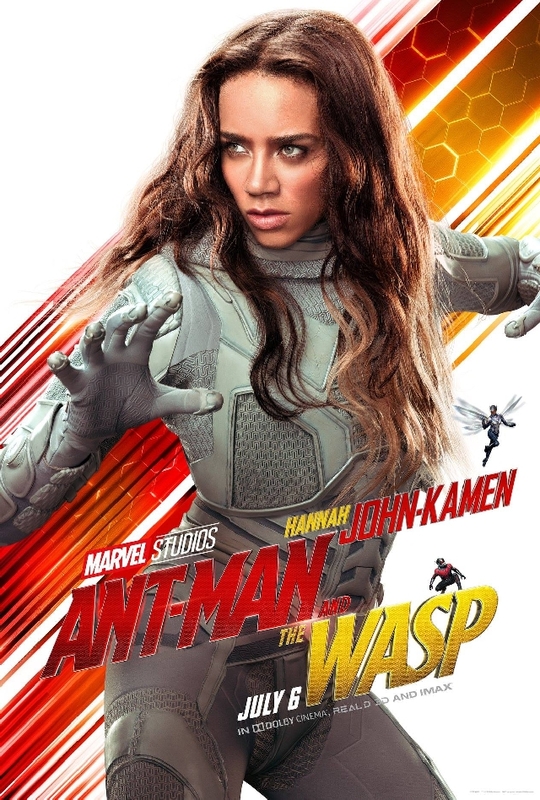 New antagonists include Walton Goggins (Tomb Raider, Maze Runner: The Death Cure) as Sonny Burch, a low-time tech hustler, and Hannah John-Kamen (Ready Player One) as Ava Starr / Ghost, a mysterious enhanced woman who can phase through solid matter (kinda like Vision). Read more about Ghost from this article by Hype. 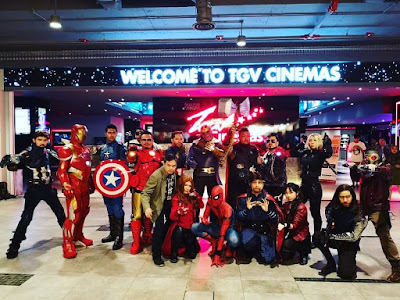 Also in Taipei, Umapagan spoke to Paul Rudd about the Withnail and I drinking game, about the MCU, and about starring alongside Hollywood legends. Catch Ant Man and the Wasp in cinemas on the 4th of July and let us know what you think about the 20th movie in the Marvel Cinematic Universe. 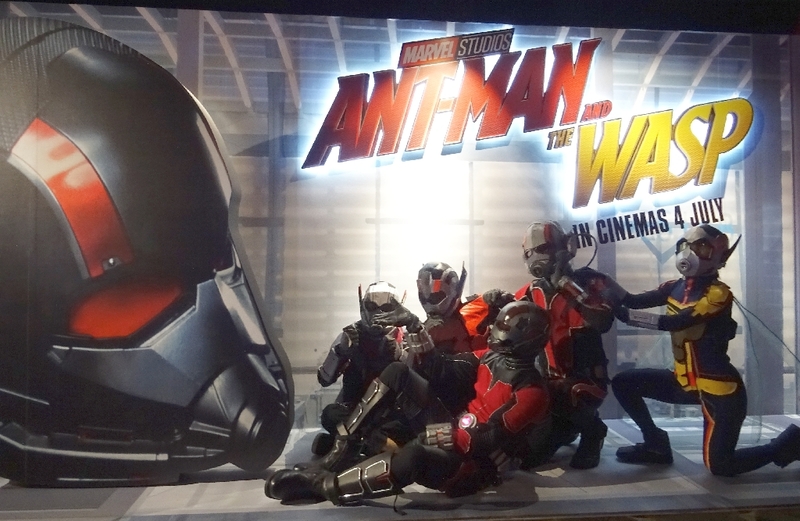 Umapagan was in Taipei recently where he caught up with the Wasp herself! 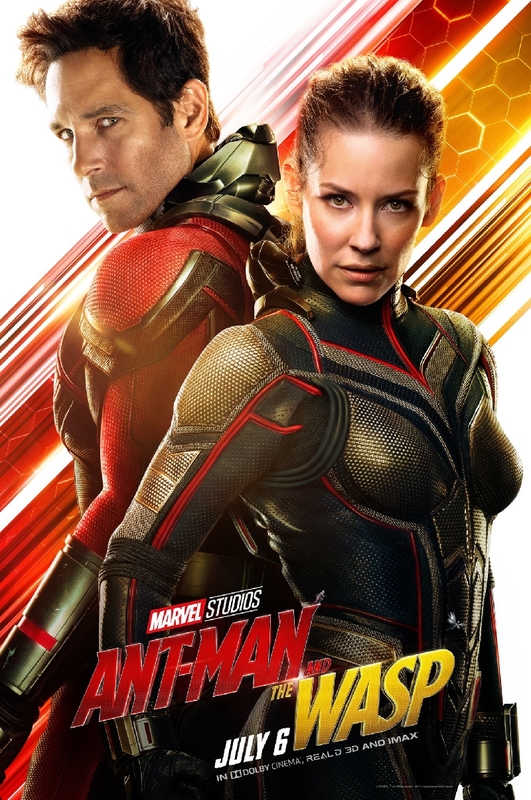 Evangeline Lilly talks to At the Movies about what it's like being the first female superhero to have title billing in an MCU movie. 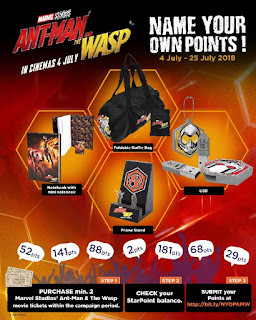 Ant Man and the Wasp will be in cinemas on July 4th. Now watch them attempt a miniature cookout session to make some fried rice! Many "ants" and a "wasp" cosplaying at the Malaysian Movie Premiere for Ant-Man and The Wasp. Remember this is a Marvel movie, so stay back during the end-credits for two bonus scenes. 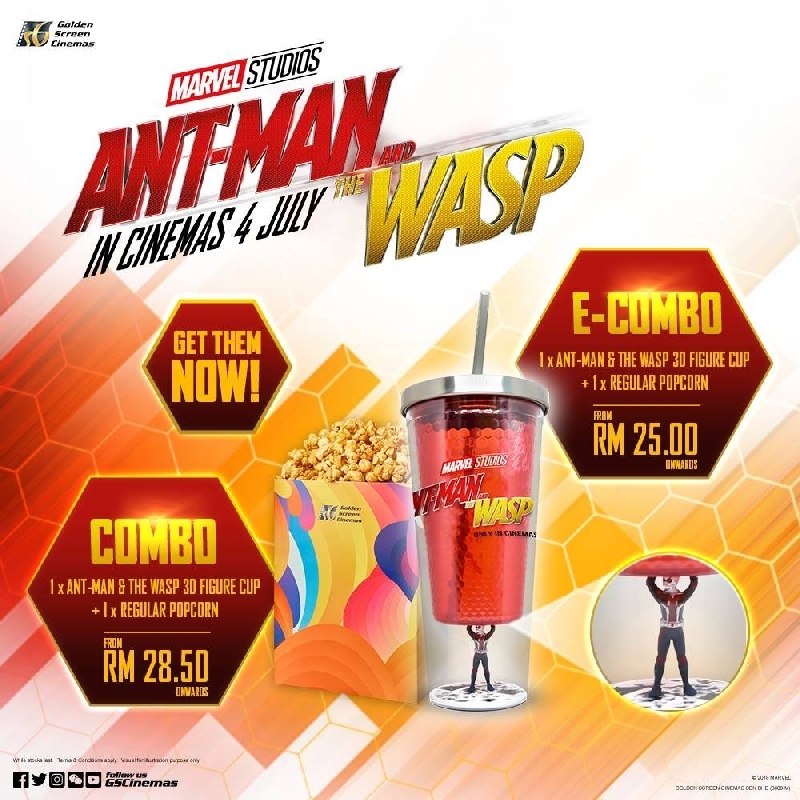 Marvel's Ant-Man and The Wasp is now showing in Malaysian cinemas nationwide. 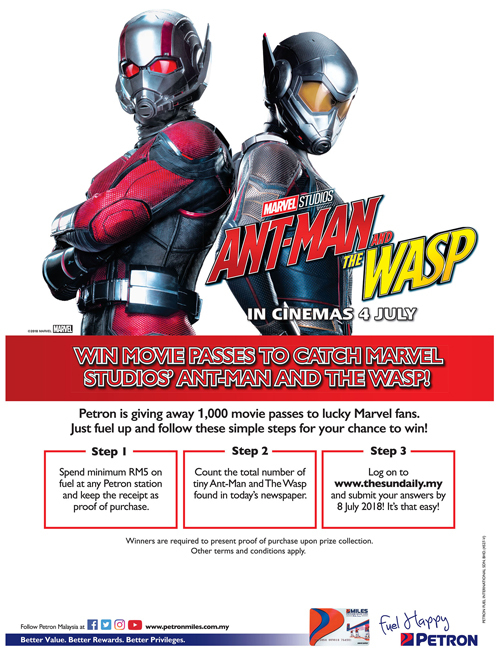 For fans who can wait (or like a 2nd or 3rd round) or regular movie goers, The Sun newspaper together with Petron Malaysia is giving away open tickets to watch Ant-Man and The Wasp starting next week. To participate spend a minimum RM5 on fuel at Petron stations then get hold of The Sun published on 2 July to count the number if tiny Ant-Men and Wasps. Read terms and condition plus submit entries by 8 July through via The Sun website page here. For collectors of geek stuff, the Outpost Movie Recon Team (M.R.T.) has special intel below for you all to bring home a piece of the action. Starting first from GSC Cinemas, there are so many movie merchandise giveaways that will have fans coming back again for repeated screenings of this movie. 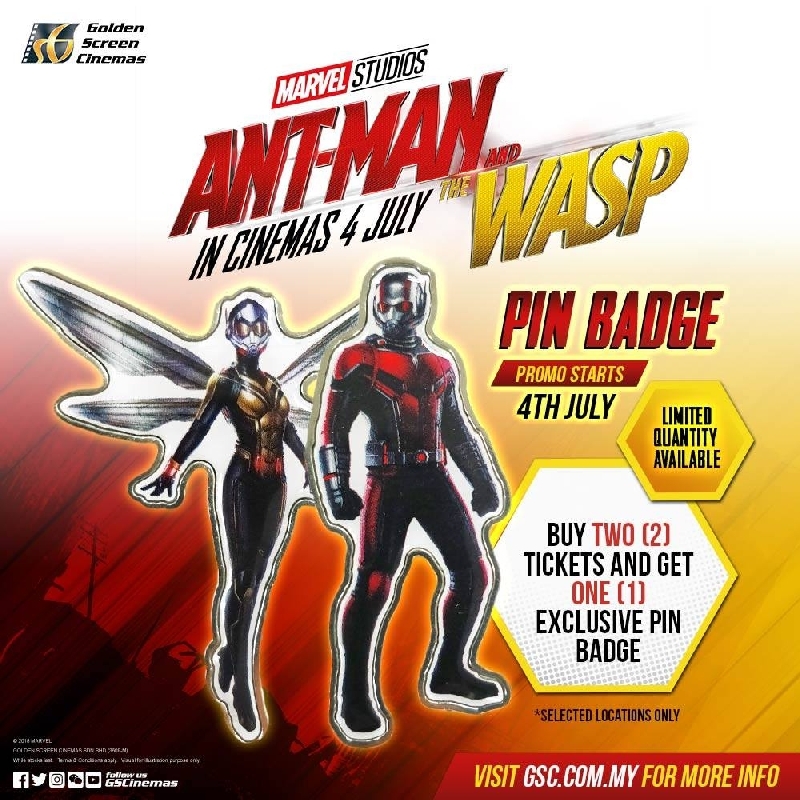 Available right now with purchase of two movie tickets are a Special Print Edition poster and exclusive Pin Badges. 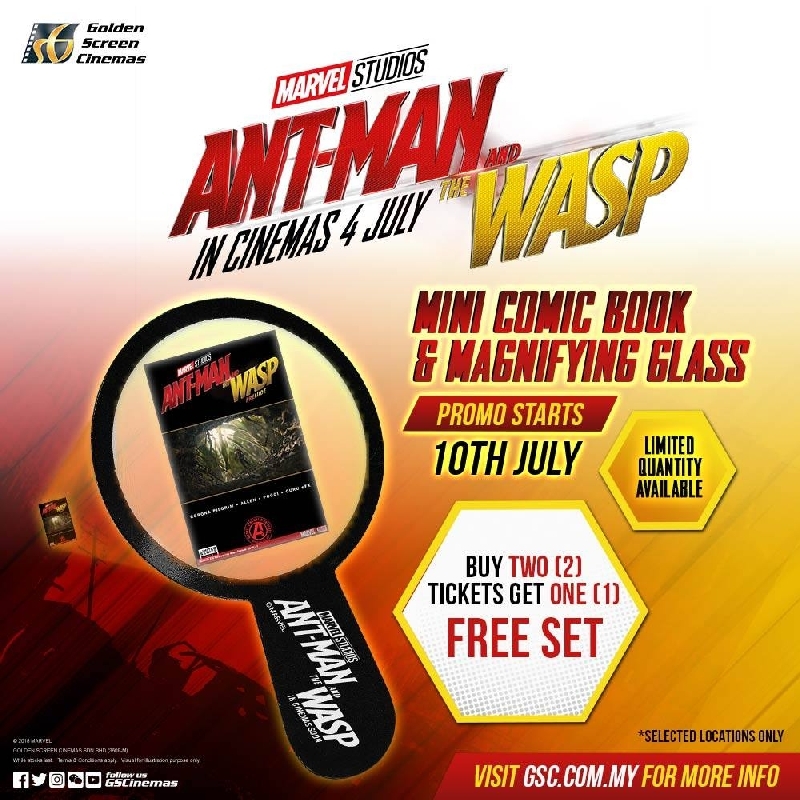 Then starting next week from 10 July will be a Mini-Comic Book with Magnifying Glass, and from 14 July will be Collectible Coin. These are given out with purchase of two movie tickets as well. 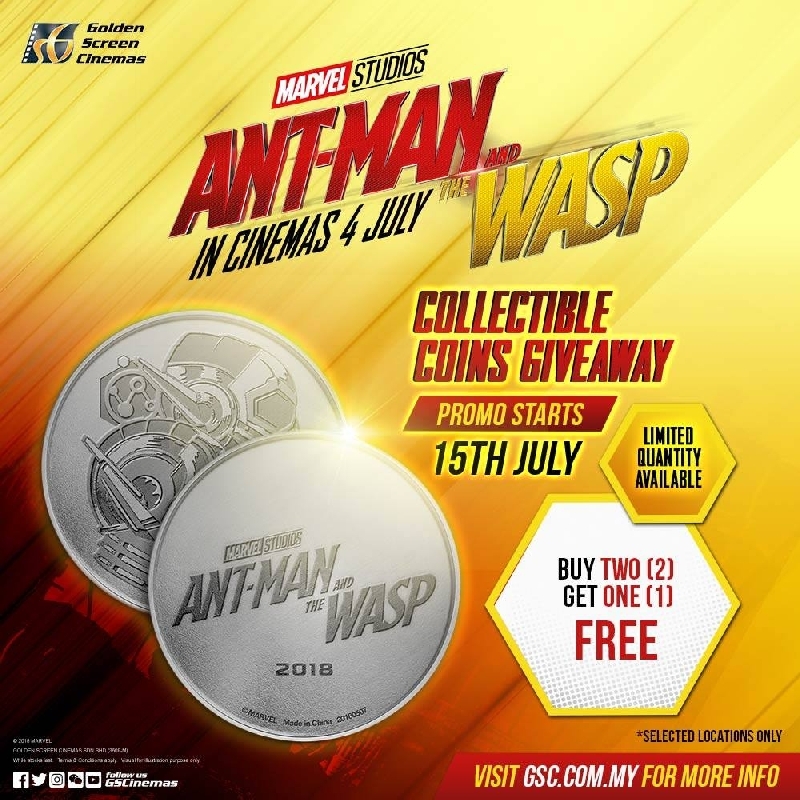 Check the full terms and conditions plus availability from GSC's website. There are also a few type of concession combo deals. The 3D Figure Cup looks way cool and available as part of popcorn combo. For official Ant-Man and The Wasp metallic foil tshirts, there are three designs available. 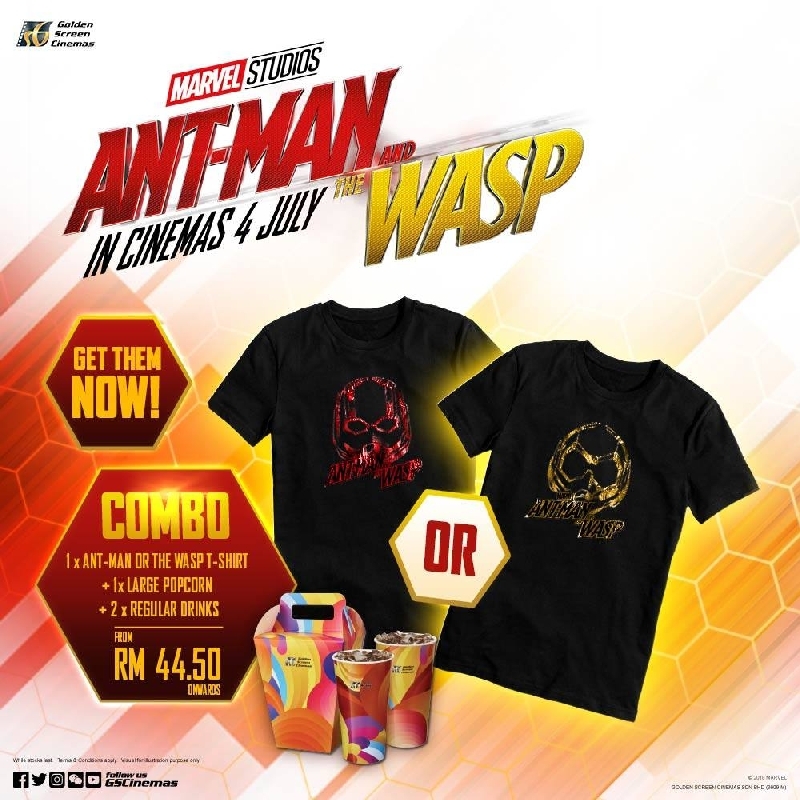 Two designs of either Ant-Man or The Wasp come as part of a concession combo with popcorn and drinks from RM44.50. 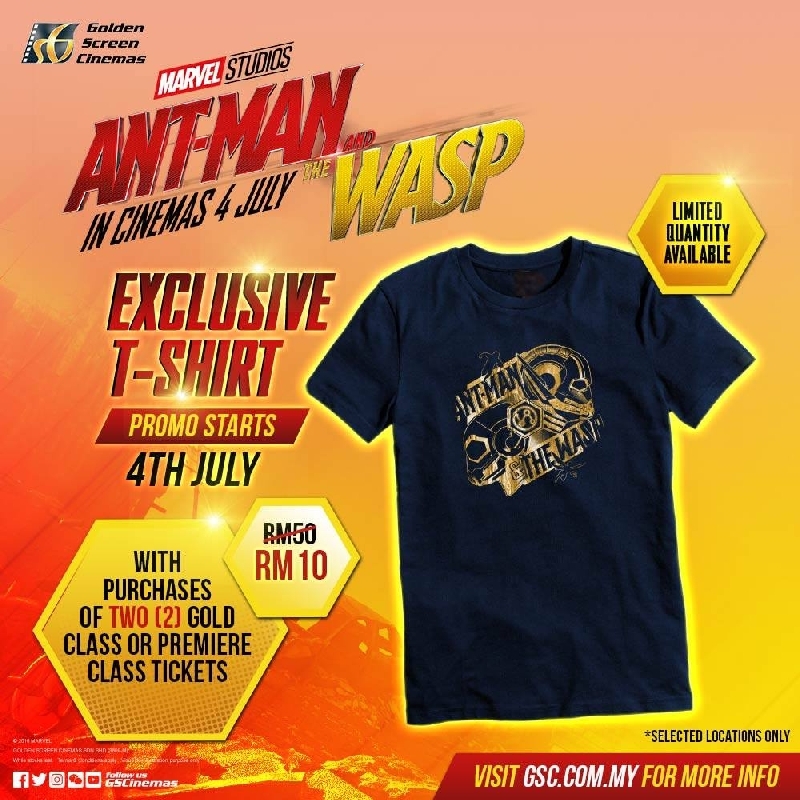 The third design featuring both superheroes is available for only RM10 with purchase of two Gold Class or Premiere Class tickets. Again check availability from GSC's website. Over at TGV Cinemas, they are offering a Ant-Man Popcorn Bucket which resembles the helmet of our titular hero. 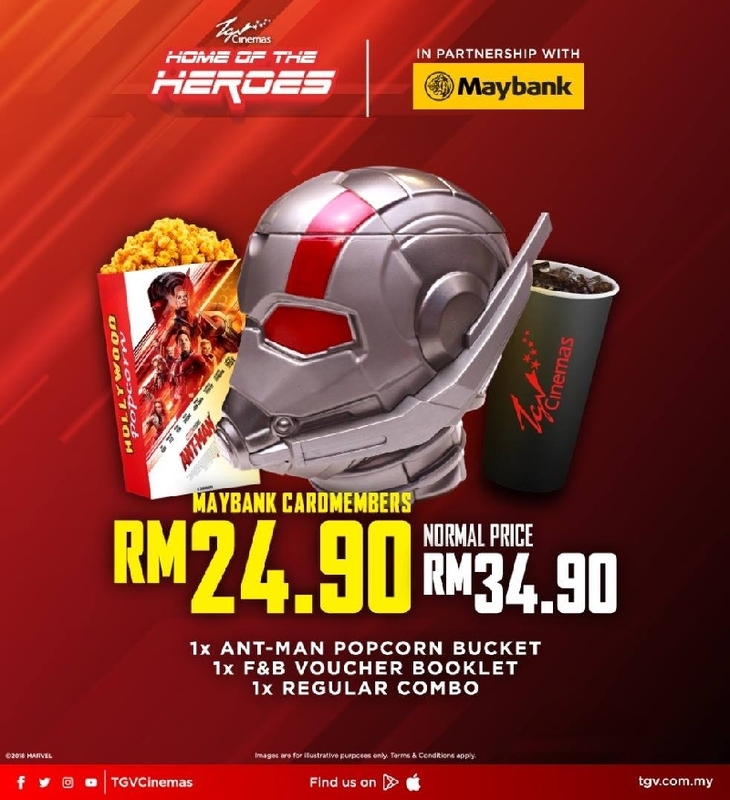 It is sold together with popcorn and drinks for RM34.90, or RM10 less for Maybank cardmembers. 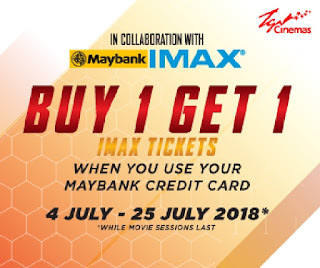 Maybank credit card holders may also take advatange of Buy 1 Get 1 offer for IMAX tickets, hence bring a partner / friend for FREE. 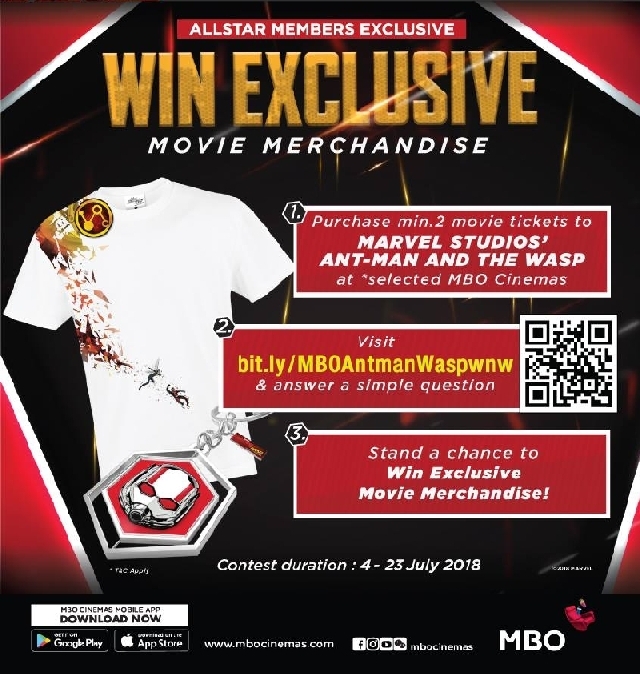 Finally as part of their promotional campaign to send a MovieClub member to New York Comic Con (NYCC), purchase two tickets to redeem an Ant-Man and The Wasp Collectible Card which is the final piece required to qualify joining this slogan contest. NYCC takes place 4 to 7 October 2018 and is typically SOLD OUT months in advance so this is certainly an opportunity not to be missed for geek pop culture fans eligible for travel to the United States. 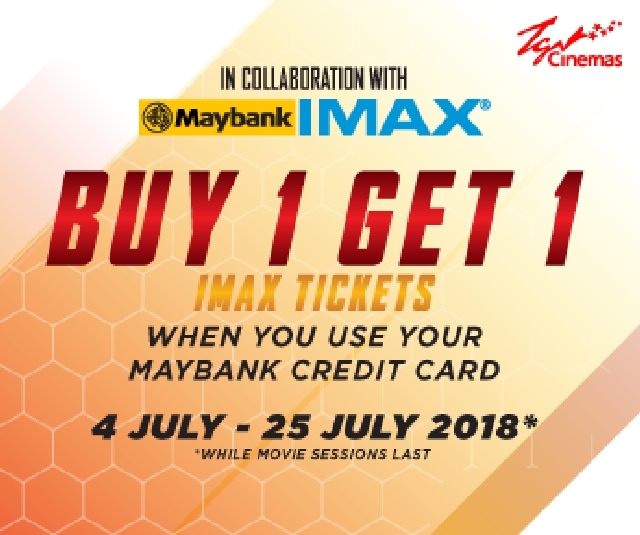 Read up all the terms and conditions for these promos at TGV's website. 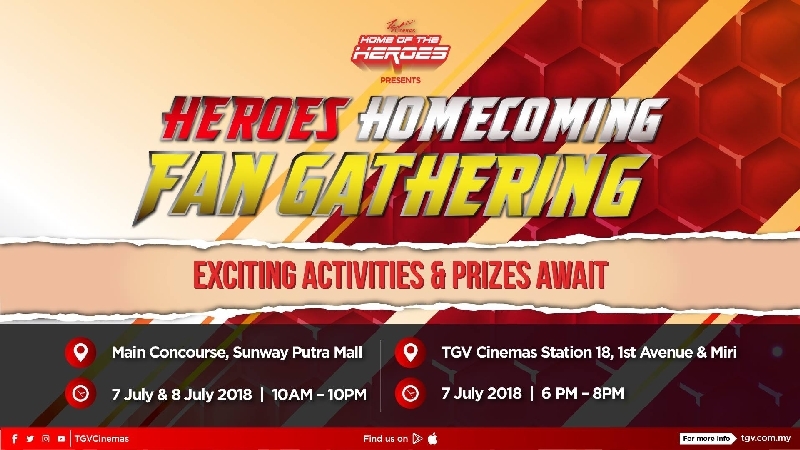 In addition, TGV Home of Heroes is celebrating this summer blockbuster season of superheroes movies with a Heroes Homecoming Fan Gathering taking place a cinemas across the country. 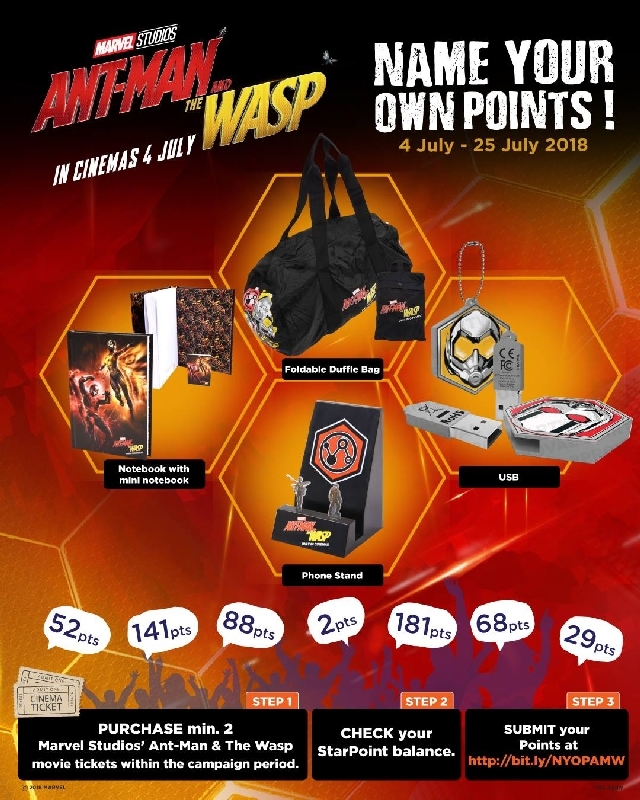 The BIGGEST fan engagements will take place this weekend 7-8 July 2018 at the Main Concourse of Sunway Putra Mall, Kuala Lumpur from 10am to 10pm with comic book superhero exhibits, video games, green screen photo booth, popcorn giveaway and lucky draws. 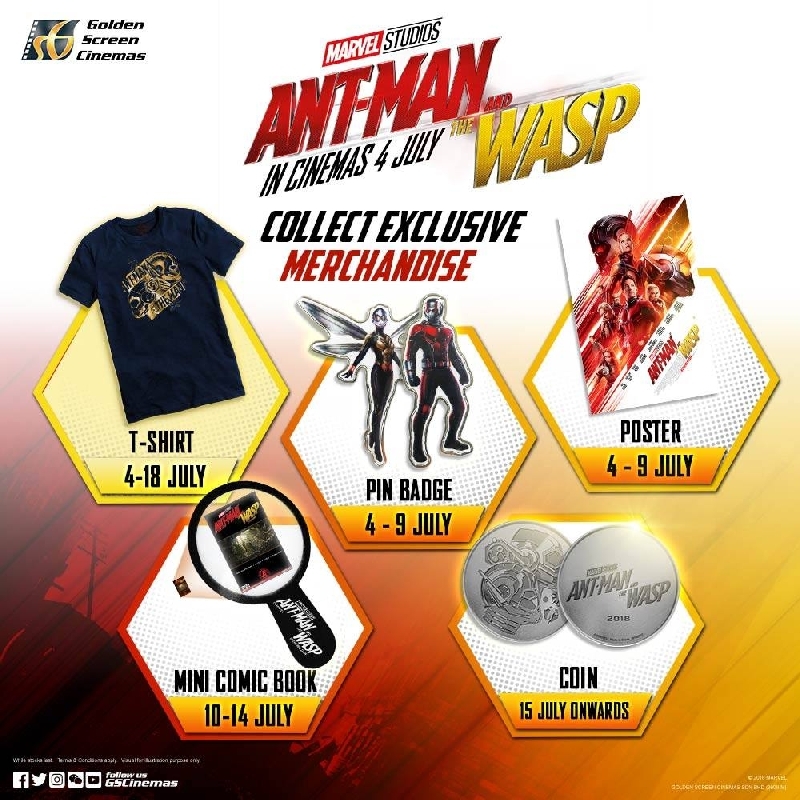 Plus FIRST 12 qualified registrations receive an Ant-Man Popcorn Bucket. Participation is FREE with Registration opening at 6pm until 7pm with maximum of 20 pax. 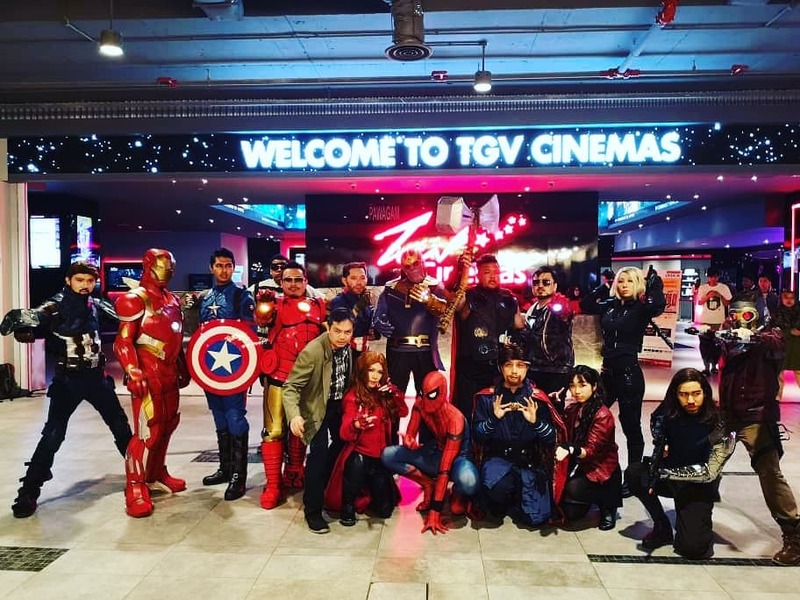 Be sure to check Terms and Conditions for the Cosplay Competition at TGV's website. 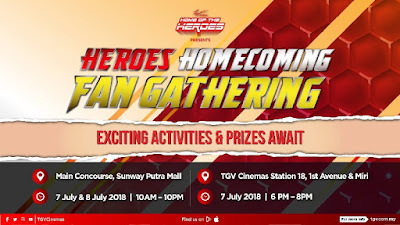 For the latest updates on what's happening join the Heroes Homecoming Event Listing on Facebook and stay tuned. 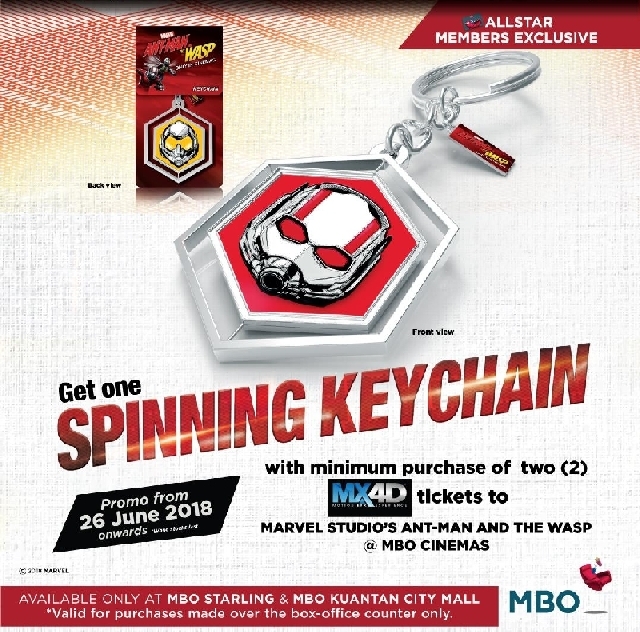 Now at MBO Cinemas, an official Spinning Keychain is available free with purchase of two MX4D movie tickets, which is only available at Starling Mall and Kuantan City Mall for purchases over the counter. 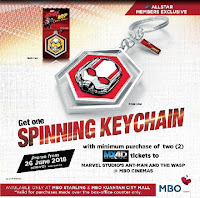 Alternatively this keychain and limited edition tshirt may be won by AllStar members through contest until 23 July with purchase of two Ant-Man and The Wasp tickets to enter. AllStar members can also use their points to redeem four different movie premiums bidding with their points; read-up on bid mechanics with terms and conditions. 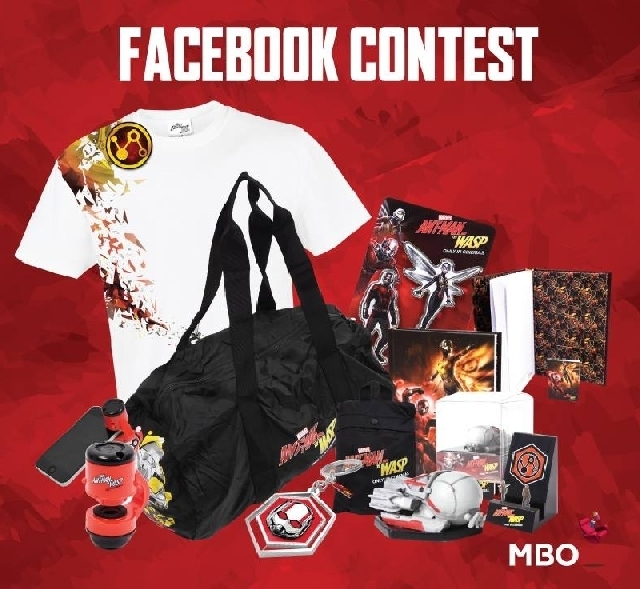 Finally, a contest is open to all Facebook users to simply win some loot by commenting on this MBO post. 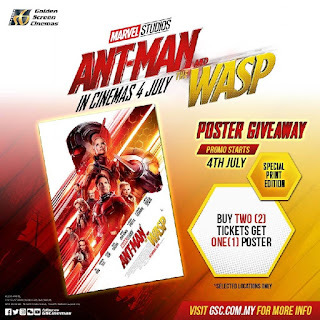 HypeMY has a contest offering similar movie premium so check out their website here on how to participate. Now we've mentioned Petron Malaysia earlier, but they have even yet more stuff to giveaway including an all-expense 5-Day 4-Night Marvel VIP Experience in London with tickets to London MCM Comic Con in 2019! 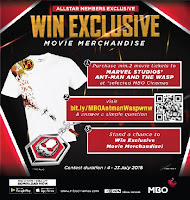 In addition there are 50 weekly prizes of Limited Edition Ant-Man and The Wasp movie premiums. 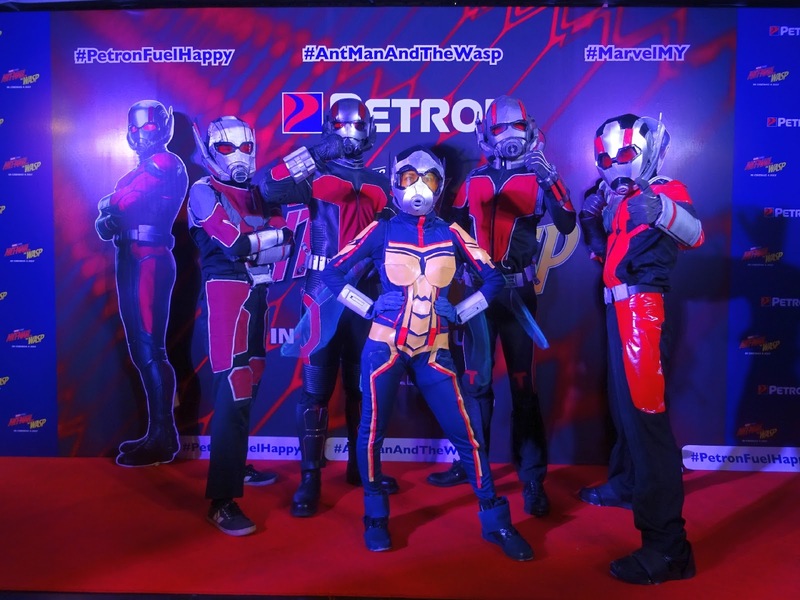 To enter spend a minimum of RM50 on fuel swiping Petron Miles Card to enter. 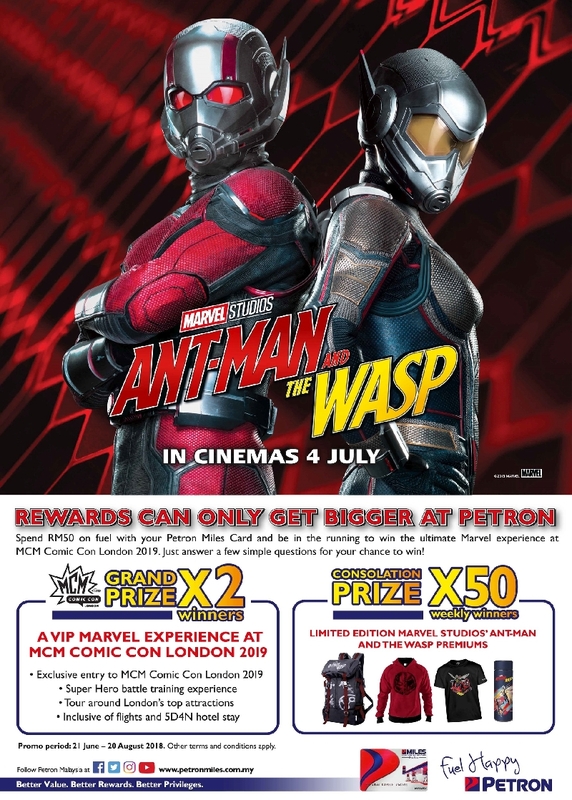 Read more on this great fan experience opportunity reported by The Sun here and get full terms and conditions from Petron's website. 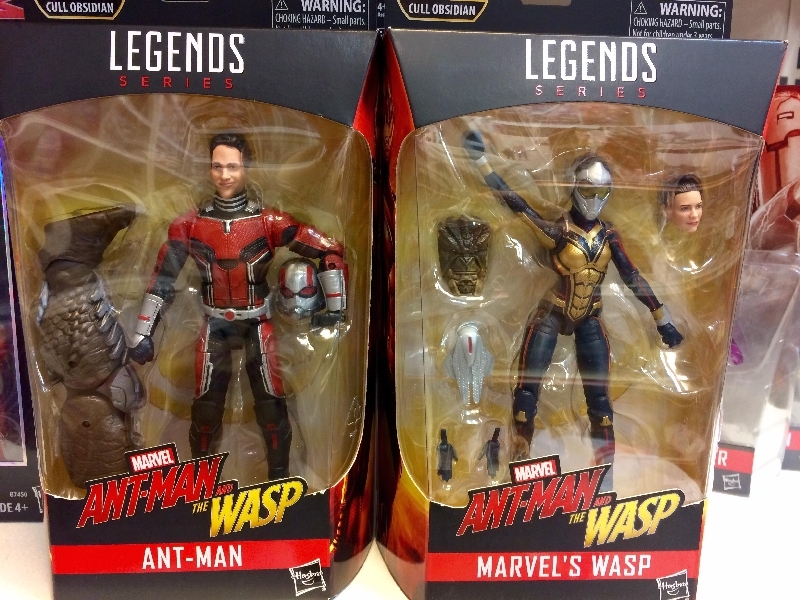 For toys for the BIG boys and kids, 6in scale action figures of Ant-Man and The Wasp are available from Hasbro's Marvel Legends series priced at RM132. The head sculpts are really good this time with Scott's expression matching the nature of this movie. 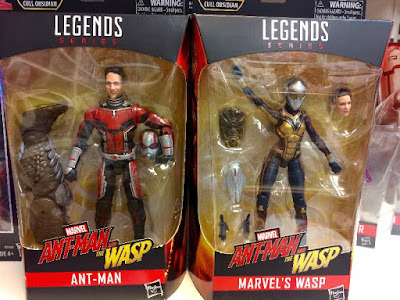 They may be a bit hard to find at regular toy retailers since released as part of an Avengers Infinity War set (with parts to build Cull Obsidian) so do check out toy collectors hobby stores instead. 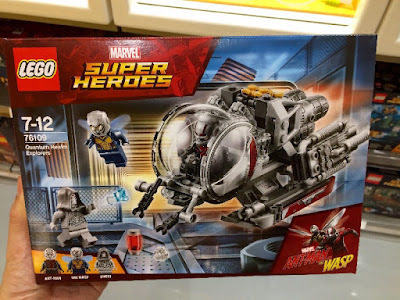 Fans of LEGO can pickup the official 76109 Quantum Explorer building set which includes all three main characters of this movie as minifigs: Ant-Man, Wasp and Ghost. These are priced at RM122.60 and should be available at major toy retailers and LEGO shops. 25 feet. 65 feet. Does Size Matter? Find out in Ant-Man and The Wasp! Disclaimer: Ant-Man, The Wasp and associated trademarks are copyright to Marvel Entertainment, referenced here for fan service purposes only without intent to infringe.